I probably will not being doing a review of the movie adaptation, seeing as it is my favorite movie, but because of this I HAD to read the book. I saw Silver Linings playbook when it first came out and it has been my favorite movie ever since, I then found out it was a book and it has taken me forever to find it. I recently got my hands on it at a library and I could not put this book down. I am well sleep deprived writing this review because of this book! 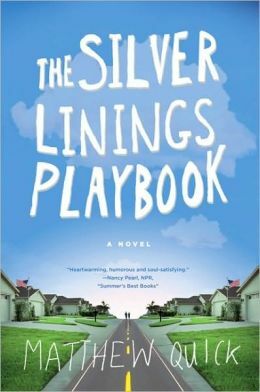 The Silver Linings Playbook is about Pat Peoples and his struggle with coping with reality after being in a mental institution after something happened with his wife. He then befriends Tiffany, a woman who lost her husband and is also a little bit screwed up in her head because of it. You find out early on that Pat is a very unreliable narrator. I absolutely love the way he tells the story, it’s like peaking inside someones head that is crazy, it’s almost child like. Tiffany, though I wish was more vocal and fleshed out, is great too. I understand why she was made to be quite and less dialogue based but I still wish I could see more of her. For me though my favorite characters were his brother Jake, and his therapist Cliff. Now I don’t want to delve too deep into this novel, because there is so much you can spoil having an unreliable narrator. All I will say is that this is not a romance novel, at least not your normal romance novel. It is about Pat getting over his mental illness, and his journey. Also I notice a lot of people complaining there is a lot more football in this than the movie, ya its called The Silver Linings PLAYBOOK. I would recommend this book to nearly anyone, it is not your average read and you are in for a roller coaster. I loved it. I LOVED this book, too!!!! I actually ended up reading it after I saw the movie, but it was still fantastic. 🙂 It was one of those books I really needed to read at that point in my life!